Next week I’ve got my last three days at Emory. Between now and then, I’ve got a lot of library books to return, a project site to (beta) launch, and a presentation to share. I just sent off my exit report to CLIR, and thought I’d share the bulk of it here (partly inspired by Monica Mercado’s similar recent post). My position at Emory was shared between the Stuart A. Rose Manuscript, Archives, and Rare Book Library, and the Emory Center for Digital Scholarship. My work focused on digital projects that drew on Rose Library materials for research, outreach, and instruction. I collaborated with colleagues at Rose and ECDS, as well as software engineers, faculty, and students. During my fellowship, I have been working on a project building network graphs of a selection (about 56) of the Rose Library’s African American collections, Networks of African American Culture: A Portrait of a Collecting Strength. At the outset, I had an anecdotal sense that the collections were interconnected. And my own research was interested in interpersonal relationships that facilitated African American art and activism, and was largely based on recovering documents from archives. So I thought it would be interesting to see how I might represent these interconnections in the Rose Library in network graphs. When I arrived at Emory, the Belfast Group Poetry | Networks project team had already created a methodology to create network graphs based on Rose Library finding aids—in their case, focusing on Northern Irish poets’ collections. The finding aids are published in an xml language, EAD, which allows tags to identify names of people, organizations, places, and titles. I worked with the digital archivist and software engineer working on that project to expand the scope of what we could tag in the finding aids to create RDF triples, connecting those named entities to the collection or the creator of the collection. While I was initially interested in the interpersonal relationships, I began to consider the life of the collections themselves, and how they got to Emory, as well as the choices made in describing the collections in the finding aids, which vary in level of detail from collection to collection. The project site, which is nearly ready for a beta launch, presents not only the network graphs, but also interviews with archivists and curators, and essays that contextualize the network graphs. I raise questions about the decisions archivists make in arranging and describing collections–because of archivists’ bias (their education and interests), the nature of the collection itself, or shifts institutionally and professionally in what was considered necessary to describe–and discuss how these variations across collections impact the network graphs. I also wanted to capture some of the histories of collections that aren’t recorded in a finding aid or provenance statement—the friendships and interpersonal networks among curators, collectors, and people with materials, which are known by anecdote, but are not recorded anywhere. I presented on the methodology for this project at DLF in 2015, and published a short piece in the Rose Library magazine (the image from which will be produced as a postcard). I will publish a piece on the Southern Spaces blog, and plan to draft a journal article in the coming year. I will give a presentation on the project at the library next week. While my Portrait of a Collecting Strength project made use of metadata that was already in an electronic form, the Turner Cassity Born-Digital Collection made use of the already digital born-digital materials in poet Turner Cassity’s papers in the Rose Library. With Dorothy Waugh, digital archivist, Sara Palmer, electronic text specialist in ECDS, we made the word processing files from his computer publicly accessible online in an Omeka site, and I created an exhibit that explores how digital humanities methods might be applied to born-digital archival materials. This kind of exploration of born-digital archival materials is normally impossible because of security restrictions on how researchers can access such materials. I used named entity recognition (NER) tools to identify the proper place names mentioned across the hundreds of poems in the corpus, and then plotted those locations on a map, as an alternative way to enter into the collection. I also used the Neatline plugin to create a timeline of all of the files, based on their date of creation. These experiments have contributed to conversations at the Rose Library about what kinds of access we might offer researchers to facilitate new kinds of research with born-digital archival materials. Typically, and understandably for this relatively new field, born-digital archives has focused on issues of capturing and preserving data; now, there is room for conversations about types of access and potential digital tools for research. 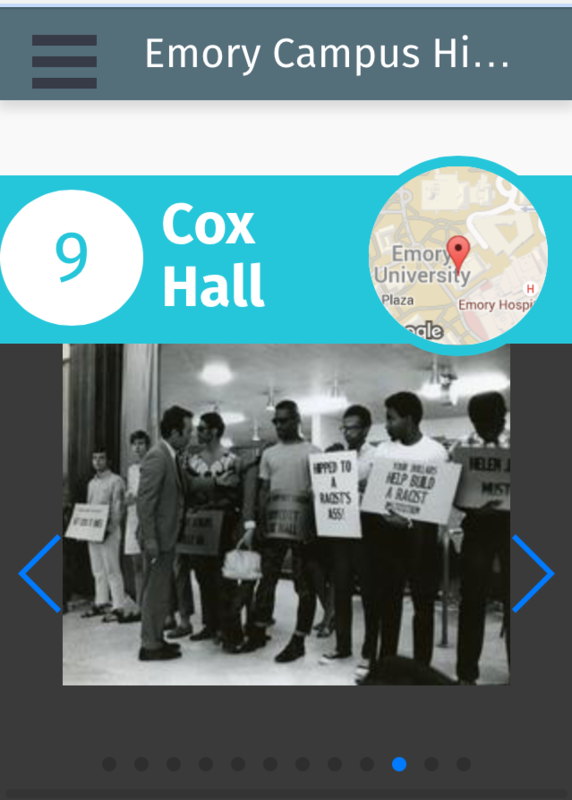 Finally, the other major digital project I completed during my fellowship was Emory Campus History Tour, created with Matthew Strandmark, a library fellow for outreach at Rose. We built the tour on the Emory-authored platform OpenTourBuilder. The tour presented digitized materials from the university archives; video interviews from experts on various aspects of campus history; as well as original narrative and directions between tour stops. The tour launched with a panel funded by the Georgia Humanities Council and was also featured in an exhibit in the Emory Administration building. I also contributed to planning for digitization that I hope will form the basis of future projects. I contributed to a proposal for an NEH Humanities Collections and Reference Resources implementation grant to catalog and digitize African American periodicals in the Rose Library backlog. I supervised graduate student workers who populated an inventory of the periodicals, so that we could assess the number, format and dates of the materials we had, and put them in a rough alphabetical order. Based on that inventory, we were able to estimate what percentage of the [over 10,000] periodicals we might be able to digitize and make publicly available. In addition to my own digital projects, I have been interested in thinking about how undergraduates might create digital projects, or use digital methods that analyze archival materials. I have consulted with several faculty about using Omeka in their classes, including with Donna Troka, for her classes’ Resisting Racism online exhibit, which accompanied a physical exhibit they created for the Rose Library. I have also been part of a pilot project in the Rose Library, working with a digital archivist and instruction archivist, to create a unit for an undergraduate literature course that uses the text analysis tool Voyant to analyze born-digital drafts of poetry. The unit should be tested in a course this fall; we initially tested the assignment with Rose Library staff, introducing them to Voyant and getting feedback on the assignment design. I led numerous workshops for librarians, faculty, and students on digital methods, tools, and pedagogy in ECDS. I also had a weekly shift in the Rose Library reading room, delivering materials to patrons and ensuring they were familiar with the library’s guidelines for handling the materials. After attending an Accessible Future workshop hosted at Emory (a review of which I wrote for the Journal for Interactive Technology & Pedagogy), I drafted an accessibility statement for ECDS, and co-facilitated a webinar on web accessibility for Emory staff and faculty in partnership with the Office of Access, Disability Services and Resources. The CLIR fellowship introduced me to the professional and intellectual work of librarians, opening up a world that I’d previously only known from the researcher side. (I had worked at a public library previous to graduate school, but I wasn’t really immersed in the profession there.) Learning about the work and intellectual problems that librarians and archivists care about–at work, attending library conferences, and lurking on #critlib chats on twitter–has fostered a critical awareness of information infrastructure. In addition, because my postdoc position was split between two organizations within the Library & IT division of the university, I had the benefit (and challenge) of simultaneously experiencing two different organizational cultures and positions within the university. The projects on which I’ve worked have led me to develop some expertise in archival practices and a variety of digital tools. I have a much deeper understanding of the work that archivists do, and became interested to bridge the disciplinary divide between, for instance, archivists who work in archive and humanities scholars who invoke “the archive.” In this vein, I organized and moderated a roundtable on Archival Practices at the 2016 Modern Language Association conference, which brought archivists and humanities scholars into conversation. As I worked on my fellows project, A Portrait of a Collecting Strength, I became interested in making visible the work of archivists for researchers. I am increasingly committed to critical examination of the institutional and algorithmic processes that makes information available and accessible to the public—questions that have an impact beyond the world of the library, for researchers and students, as well as the general public.